High-level disinfection is defined as the complete elimination of microorganisms in or on an instrument, except for small numbers of bacterial spores. To reduce the risk of ultrasound probe cross-infection, it is important to know when to perform the HLD process. HLD should be performed on probes that are used in semi-critical procedures, as defined by The Spaulding Classification. What procedure will your probe be used for? Applying the correct level of disinfection is based on the procedure the probe is going to be used for on the next patient. 1 in 25 patients will acquire an infection during a hospital stay1. Up to 70% of HAIs are preventable using existing infection prevention practices3. 12.9% of transducers are contaminated with pathogenic bacteria following routine disinfection5. Up to 9% of barrier sheaths and condoms leak7. HAIs cost the U.S. up to $147 billion annually in direct and indirect costs2. Of the 1.7 million people infected in U.S. hospitals, 98,987 die4. As a result, there are more efforts around controlling and preventing HAIs than ever before - and the disinfection of ultrasound transducers can play a critical part in that. Up to 7.5% of transvaginal ultrasound transducers were found to have HPV DNA, a known cause of cervical cancer, after low-level disinfection with wipes6. One of the Top 5 non compliance findings by The Joint Commission is reducing risk of infections associated with medical devices or equipment8. trophon®2 offers a fast and simple solution for the high-level disinfection of ultrasound probes. Complete TEE probe disinfection and protection. 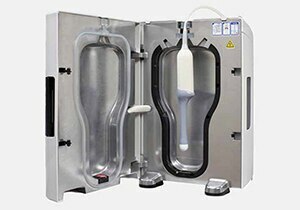 Environmentally friendly, efficient system for the complete high-level disinfection of ultrasound transducers. trophon®2 offers a fast and simple solution for the high-level disinfection of ultrasound probes. Disinfection takes place in an automated, closed system and uses a sonicated hydrogen peroxide mist. Its automated functionality helps ensure consistency in your HLD process, while traceability solutions can help you meet compliance requirements. 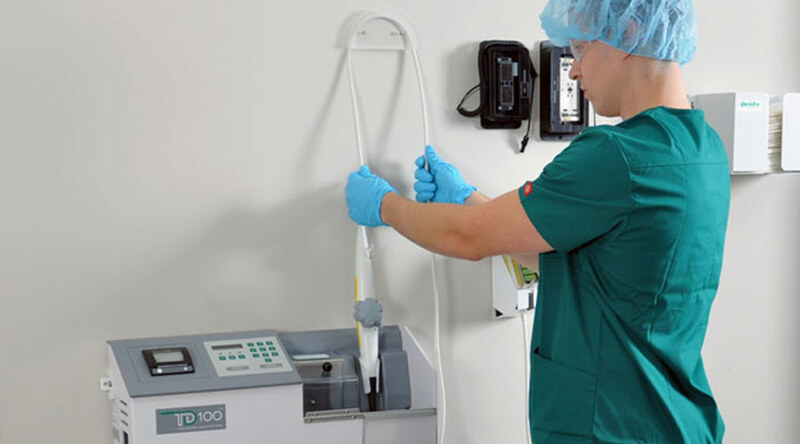 The TD 100® automated TEE probe disinfection system automates, standardizes and simplifies the disinfection and handling of ultrasound transducers from exam to exam to enhance patient and staff safety, minimize the risk of probe damage, facilitate regulatory compliance and help improve efficiency. 2. Marchetti, A. and Rossiter, R. (2013). J Med Econ 2013 Dec;16(12):1399-404. 3. Scott RD. Atlanta: Centers for Disease Control and Prevention (2009). 4. Klevens, M et al., Estimating Health Care-Associated Infections and Deaths in U.S. Hospitals,. Public Health Rep. 122: 160-66, 2007 (2002 Data). 5. Leroy SJ. Hosp Infect 2013 83(2):99-106. 6. Ma S et al. Emerg Med J. 2013 30(6):472-5. 7. Vickery K et al. J Inf Pub Health 2013; in press. 8. Electronically accessed: thejointcommission.org. May 2014. Issue Two. Improperly sterilized or high-level disinfected equipment. 9. RutalaWA, Weber DJ, HICPAC. Guideline for Disinfection and Sterilization in Healthcare Facilities. USA: Centers for Disease Control; CDC 2008. 10. American Institute of Ultrasound in Medicine. Guidelines for cleaning and preparing external and internal-use ultrasound probes between patients. AIUM Official Statement. Online at: http://www.aium.org/officialStatements/57. Accessed March 8, 2016. 12. Electronically accessed: Joint Commission Alert is Another Wake-Up Call for Awareness of Improper HLD or Sterilization. AORN, Inc; 2018. p. I.HLD1-I.HLD24.